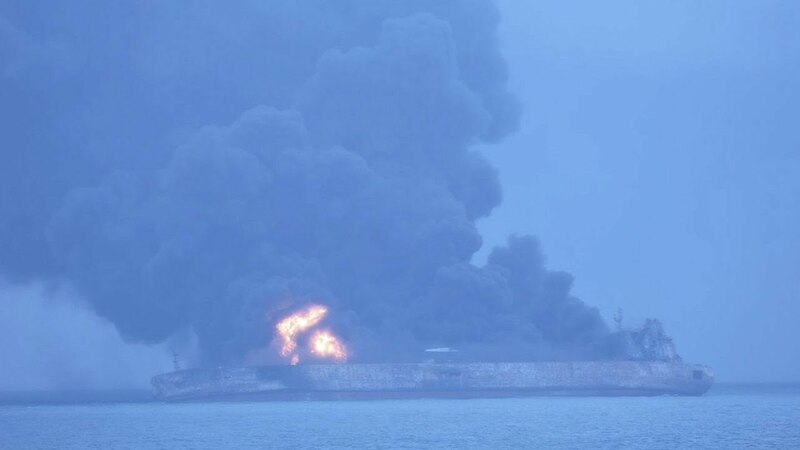 The oil tanker that set fire after colliding with a freight ship off the east coast of China may explode and sink, possibly putting the environment and human health at risk, experts warned. The Iranian tanker was carrying 150,000 tons, or nearly 1 million barrels, of condensate crude oil when it collided with the CF Crystal on Saturday. Condensate is an ultra-light hydrocarbon that is highly toxic and much more explosive than regular crude oil. The size of the oil spill from the ship and the extent of the environmental harm are currently unknown but the disaster has the potential to be the worst since the ABT Summer spill off the Angolan coast in 1991, Reuters noted. Chinese authorities have since dispatched three cleaning boats to the site. Search and rescue are also underway for the 32 crew members that have gone missing after the collision in the mouth of the Yangtze River Delta. "First and foremost, Greenpeace hopes that the search and rescue operations of the Chinese coast guard go smoothly and the 32 missing crew will be found," said Greenpeace East Asia campaigner Rashid Kang. But the environmental organization is also concerned about the potential environmental damage that could be caused by the release of the oil on board. "We are worried about the potential environmental impact that could be caused by leakage from the vessel that was holding almost 42 million gallons of crude oil. A clean up procedure is already underway and we will be monitoring its progress," Kang said. As the BBC reported, condensate is both color- and odor-less, making it hard to detect, contain and clean up compared to heavy crudes. Additionally, condensate is "not like crude, which does break down under natural microbial action; this stuff actually kills the microbes that break the oil down," Simon Boxall, of the National Oceanography Centre at the University of Southampton, explained to the news service. Boxall said the best hope was to put out the fire and stop the ship from sinking. "If she sinks with a lot of cargo intact, then you have a time bomb on the sea bed which will slowly release the condensate," he said. "There could be a long-term exclusion of fishing for many hundreds of kilometers in this area," Boxall added. Babatunde Anifowose, a senior lecturer in petroleum and environmental technology at the University of Coventry told CNN that if the tanker explodes and sinks, cleanup will be made much more difficult due to the oil seeping beneath the surface of the water. Anifowose also noted that the toxic fumes released by condensate could could be picked up by winds and carried onto nearby onshore populations. The fumes "could aggravate existing health conditions or lead to coughing or asthma," Anifowose said. But Mu Jianxin, a senior engineer at the China Institute of Water Resources and Hydropower Research, told the Global Times that the oil is soluble in water, making it easier to handle. “Pollution caused by the leak is certain, but compared to the wide watershed of the Yangtze River estuary, the 136,000 tons of oil should not cause too serious a problem," Mu said. “Some physical methods can be used to dissolve or neutralize the oily pollutant."